Throughout the whole of human history, man has struggled to find answers to any number of important (yet often difficult) questions that have to do with his origin, existence, nature, and destiny. Such queries as “Whence have I come?,” “Why am I here?,” and “Where am I going?” routinely intrigue and enthrall each of us as members of the human race. Securing clues to the exact makeup of the creature known popularly as Homo sapiens always has been one of mankind’s keenest intellectual pursuits. And along the way, perhaps no topic has perplexed us, or piqued our interest, as much as that pertaining to the origin, nature, and destiny of the soul. Contemplate, if you will, the concept of the soul and the issues that spring from it. What is the definition of a soul? If the soul actually exists, what is its origin? Do humans possess a soul? Do animals? If souls do, in fact, exist, are they purely temporal—thus living only as long as our corporeal nature exists? Or are they immortal—surviving the death of the physical body? What is the difference, if any, between the “soul” and the “spirit”? What is the ultimate destiny of the soul? And what part does the soul play in the biblical statement that men and women were created “in the image of God” (Genesis 1:27)? These are the kinds of issues that I would like to investigate in this series of articles. The subject of the soul—including its origin, nature, and destiny—has long been controversial. Some people believe that there is no such thing as a soul. Certain individuals advocate the position that only humans possess a soul, but that it ceases to exist at the death of the body. Others seek to maintain that both humans and animals possess a soul, and that those souls likewise die when the physical body dies. Still others are convinced that both animals and humans possess an immortal soul. And finally, there are those who have concluded that humans possess an immortal soul, but that animals do not. What, then, is the truth of the matter? Is there anything else? We needn’t get spooky about it. Part of the “anything else” might be human minds and personalities. Can we entirely account for our self-awareness, our minds, personalities, intuitions, and emotions, by means of a physical explanation? This is a matter of enormous significance for many of the questions we are asking in this book, and we will return to it frequently. If we are super-complex computing machines—the sum of our physical parts and their mechanical workings, which in turn exist as a result of the process of evolution—then science may ultimately be able to tell us everything there is to know about us. Even if no computer can ever assimilate the human mind, science may find another complete physical explanation. But we have at present no scientific reason to rule out the possibility that there is more to self-awareness, our minds, and our personalities than any such explanation can encompass. Is there such a thing as the soul? If there is, does its existence begin and end with our material existence? Despite some impressive advances in the field of artificial intelligence, and an increasing understanding of the way our minds work, certainly no-one would claim to be able to say at present, except on faith, whether science will eventually be able to assimilate the phenomena of self-awareness, mind, and personality into the materialistic picture. If science can’t, then there is truth beyond the range of scientific explanation. Another part of the “anything else” may be what we call the supernatural. Perhaps it is simply figments of imagination, psychological events, not so much to be explained by science as to be explained away. Or perhaps these are real events which are at present unexplainable because we lack complete understanding of the full potential of the physical world. If either is the case, then the supernatural ought eventually to fall into the realm of scientific explanation. However, if the supernatural world exists, and if it is inherently beyond testing by the scientific method, then there is truth beyond the range of scientific explanation. There may indeed be more in heaven and earth than is dreamed of in our science (if not our philosophy) [1994, pp. 82-83, emp. added]. I would like to seize upon Ferguson’s “if...then” proposition as I begin this examination of the origin, nature, and destiny of the soul. Her argument—one that far too few scientists (or science writers) are even willing to consider—is that if the supernatural exists, then there is truth beyond the range of scientific explanation. The available evidence does establish, in fact, that the supernatural exists and that there is “truth beyond the range of scientific explanation.” As famed NASA astrophysicist (and self-proclaimed agnostic) Robert Jastrow put it: “That there are what I or anyone would call supernatural forces at work is now, I think, a scientifically proven fact” (1982, p. 18). While I do not have the space here to present such evidence, I have done so elsewhere (see Thompson, 1995a, 1995b, Thompson and Jackson, 1982, 1992). The existence of the supernatural (i.e., God) may be doubted by some and ridiculed by still others, but that does not alter the evidence that establishes its reality. Thus, whenever questions of spiritual importance are under consideration—as they are when discussing the existence, origin, nature, and destiny of the soul—the only reliable source of information must by necessity be the One Who is the Originator and Sustainer of the soul. God, as Creator of all things physical and spiritual (Genesis 1:1ff., Exodus 20:11), and Himself a Spirit Being (John 4:24), is the ultimate wellspring of the soul. The Bible, then, as God’s inspired Word (2 Timothy 3:16-17; 2 Peter 1:20-21), must be the preeminent authority on this subject. In the great long ago, the psalmist wrote: “The sum of thy word is truth; and every one of thy righteous ordinances endureth forever” (119:160). Speaking as a member of the Godhead, Christ said: “Sanctify them in truth; thy word is truth” (John 17:17). We—if we would know the truth about the soul—must examine that Word in an in-depth fashion and be prepared to accept what it says. Only then can we obtain the answers to the many questions on this vital topic that have perplexed and plagued us through the millennia. If you and I were having a conversation and I mentioned the word “banana,” likely you would have absolutely no difficulty understanding my meaning. Your thought processes immediately would conjure up a long fruit—with a yellow outer covering and a light beige, inner soft body—that grows on trees and is useful as food for both humans and animals. But were I to ask you to define the term “foil,” without seeing the word in context you could not possibly know what I meant. I might be referring to: (1) a noun that is used to define a fencing sword; (2) a noun that indicates a thin, shiny metal used by cooks in kitchens all over the world; or (3) a verb that is used as a synonym for “defeat.” However, if I were to say, “I covered the turkey with foil prior to placing it in the oven,” you would know immediately what I had in mind. These terms are not technical words in the sense that they have one consistent meaning throughout Scripture. They display unity and diversity by being synonymous at times when referring to the immaterial side of man, and at other times, referring to different functions or ways of relating. It is obvious that we should not impose 20th-century standards of consistency and linguistic preciseness to a book which was written thousands of years ago... (1984, p. 44). ...may have a dozen different meanings, depending on the context and the progressive nature of revelation. The failure to avoid reductionistic and simplistic definitions is based on the hidden assumption that once the meaning of a word is discovered in a single passage, this same meaning must prevail in every other occurrence of the word.... The resistance to the idea that what soul meant to Moses was probably not what it meant to David or Paul is based on their unconscious assumption that the Bible is one book written at one time. Thus as we approach the biblical term which describes the immaterial side of man, we will not attempt to develop artificial definitions based upon the absolutizing of the meaning of a word in a single passage but recognize that a contextual approach will reveal a wide range of meanings (1984, pp. 44-45, emp. added). The word “soul” does indeed enjoy a “wide range of meanings.” In order to understand those meanings, it is necessary to examine how the word is employed within the various contexts in Scripture where it appears. The word for “soul” in the Bible (Hebrew nephesh [from naphash, to breathe]; Greek psuche) is used in at least four different ways (see Arndt and Gingrich, 1957, pp. 901-902; Thayer, 1958, p. 677). First, the term is employed simply as a synonym for a person. Moses wrote: “All the souls (nephesh) that came out of the loins of Jacob were seventy souls (nephesh)” (Exodus 1:5; cf. Deuteronomy 10:22). In legal matters, the word soul often was used to denote an individual. The Lord told Moses: “Speak unto the children of Israel, saying, ‘If a soul (nephesh) shall sin through ignorance against any of the commandments of the Lord concerning things which ought not to be done’...” (Leviticus 4:2). When Jacob was speaking of himself in Genesis 49:6, he used the expression, “O my soul (nephesh)”—which meant simply “me.” Numbers 9:6 records that “there were certain men, who were unclean by reason of the dead body (nephesh meth) of a man, so that they could not keep the Passover on that day” (cf. Number 6:6 and Ecclesiastes 9:5). In the New Testament, the word psuche is employed in the same manner. In Acts 2:41, Luke recorded that “there were added unto them in that day about three thousand souls (psuchai).” In Peter’s first epistle, when he addressed the topic of the Genesis Flood, he referred to the fact that “few, that is eight souls (psuchai), were saved by water” (3:20). In each of these instances, actual people—individually or collectively—were under discussion. ...the word soul from the Hebrew nephesh occurs, for the first time in the sacred writings, at Genesis 1:20, where it is assigned to fish, birds, and creeping things. (See also, another similar usage in Genesis 1:30.) As thus used, it is clear that the soul in these passages does not refer to anything peculiar to the constitution of man. It signifies, as its usage denotes, and the lexicons affirm, any creature that breathes, in all of these early occurrences in the book of Genesis. Nor is it correct to conclude that the phrase breath of life in the statement of Moses (“And the Lord God formed man of the dust of the ground, and breathed into his nostrils the breath of life; and man became a living soul”) sums up, or was designed to denote the whole constitution of man. The word “life” here is, in the Hebrew text, plural, literally breath of lives (nishmath khay-yim). It occurs, in similar form, in three other instances in the early chapters of Genesis (6:17; 7:15; 7:22). In the first of these the phrase is ruach khay-yim; in the second the same; in the third, nishmath-ruach khay-yim, and out of the four instances where the phrase, the breath of lives, occurs in our translation the last three are applied to the beasts, birds and creeping things. It follows, therefore, that the phrase “breath of life” does not designate anything peculiar to man. And in view of the fact that the word “soul,” from the Hebrew nephesh, is similarly extended to include the animal world, birds and creeping things, it may not be properly limited to man... (1985, 127 :691, emp. and parenthetical comment in orig.). Then the translators realized that the first meaning of nephesh is “breath,” and so Genesis 1:20,24,30 and Genesis 2:7 all fit together in understanding Moses as saying that all animals and man too are breathers. Breathers, coupled with hayyah, “living,” the translators thought, would be well translated, in the case of animals, as “living creatures,” and in the case of man as a “living being” (1995, 23:87-88). In Exodus 21:23, Moses commanded: “But if any harm follow, then thou shalt give life (nephesh) for life (nephesh).” He later wrote that “the life (nephesh) of the flesh is in the blood” (Leviticus 17:11,14). Blood often is said to be the seat of life because when blood is shed, death ensues (cf. Deuteronomy 12:23). In speaking of God’s retribution upon the Egyptians during the time of the Exodus, the psalmist wrote: “He spared not their soul (nephesh) from death, but gave their life over to the pestilence” (78:50). In this particular instance, the Egyptians’ souls represented their physical life and nothing more. Ezekiel later observed: “The soul (nephesh) that sinneth, it shall die” (18:20). In the New Testament, the principle is the same. Christ observed in regard to humans: “Therefore I say unto you, be not anxious for your life (psuche), what ye shall eat, or what ye shall drink; nor yet for your body” (Matthew 6:25). God told Joseph: “Arise and take the young child and his mother, and go into the land of Israel: for they are dead that sought the young child’s life” (psuche, Matthew 2:19). In the book of Revelation, John spoke of the fact that “there died the third part of the creatures which were in the sea, even they that had life (psuchas); and the third part of the ships was destroyed” (8:9; cf. 16:3, psuche). Many a follower of Christ was said to have risked his or her life (psuche) for the Lord. In Acts 15:25-26, Luke recorded that Barnabas and Paul were “men that have hazarded their lives (psuchas) for the name of our Lord Jesus Christ.” Earlier, John recorded Peter as saying to the Lord: “I will lay down my life (psuchen) for thee” (John 13:37-38). In Philippians 2:30ff., Paul spoke of “Epaphroditus, my brother and fellow-worker and fellow-soldier...hazarding his life (psuche) to supply that which was lacking in your service toward me.” And in Luke 14:26, one of the conditions of discipleship was to hate one’s own life (psuche)—that is, to be willing to deny oneself to the point of losing one’s life for Christ (cf. Luke 9:23; Revelation 12:11). the soulish man, since the adjective “natural” [psuchikos—BT] translates a form of the Greek word for soul, which may be expressed in English as psychical. Thus, this usage is supported by etymology and required by the context. See, especially, Paul’s teaching in 1 Corinthians 1:18-28 and 2:6-16 (1980, 122:163, emp. in orig.). Fourth, the word soul is used in Scripture to designate the portion of a person that is immortal and thus never dies. As early as the book of Genesis, the Bible sets forth such a concept. For example, in commenting on Rachel’s untimely death at the birth of her son, Moses wrote: “And it came to pass, as her soul (nephesh) was departing (for she died), that she called his name Ben-oni: but his father called him Benjamin” (Genesis 35:18). On one occasion while the prophet Elijah was at the house of a widow in the city of Zarephath, the woman’s son fell ill and eventually died. But the text indicates that Elijah “cried unto Jehovah..., ‘O Jehovah my God, I pray thee, let this child’s soul (nephesh) come into him again’ ” (1 Kings 17:21). When the psalmist prayed to Jehovah for forgiveness, he cried: “O Jehovah, have mercy upon me: heal my soul (nephesh); for I have sinned against thee” (41:4). In his discussion of the ultimate fate of those who dared to trust in earthly riches rather than in the supreme power of the God of heaven, the psalmist lamented that such people were “like the beasts that perish.... But God will redeem my soul (nephesh) from the power of Sheol” (49:15). Many years later, Christ warned His disciples: “And be not afraid of them that kill the body, but are not able to kill the soul: but rather fear him who is able to destroy both soul (psuche) and body in hell” (Matthew 10:28). In His discussion with the Sadducees in Matthew 22, the Lord quoted from Exodus 3:6 where God said to Moses: “I am the God of Abraham, and the God of Isaac, and the God of Jacob.” Christ then went on to state (22:32): “God is not the God of the dead, but of the living”—a fact that the Sadducees’ opponents, the Pharisees, already accepted as true (cf. Acts 23:8). Yet when God spoke with Moses (c. 1446 B.C.) about the patriarchs Abraham, Isaac, and Jacob, those three men had been dead and in their tombs for literally hundreds of years. Since from Christ’s own words we know that “God is not the God of the dead, but of the living,” the point is obvious. Abraham, Isaac, and Jacob still must have been living. But how? The solution to the seeming problem, of course, lies in the fact that while their bodies had died, their immortal souls had not. When the apostle John was allowed to peer into the book “sealed with seven seals” (Revelation 5:1), he “saw underneath the altar the souls (psuchas) of them that had been slain for the word of God” (Revelation 6:9). Each of these passages is instructive of the fact that there is within man a soul that never dies. 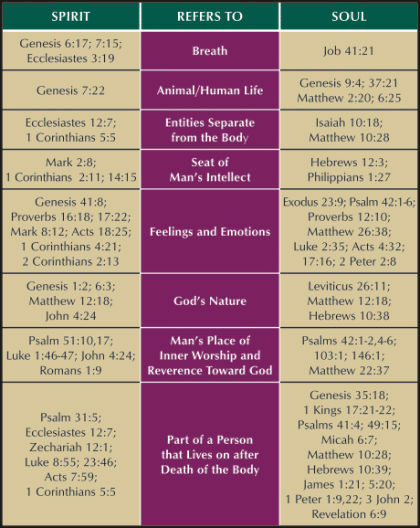 Though it is characteristic of most people today to use these terms interchangeably the scriptures very definitely differentiate them. “For the word of God is living, and active, and sharper than any two-edged sword, and piercing even to the dividing of soul and spirit, of both joints and marrow, and quick to discern the thoughts and intents of the heart.” (Hebrews 4:12.) Since the sacred writers provided for “the dividing of soul and spirit,” in those instances where they differ, so ought we and so we must if we are to entertain biblical concepts of these words. The word “spirit,” when denoting the human entity (from the Greek word pneuma), is a specific term and designates that part of us which is not susceptible to death and which survives the dissolution of the body. (Acts 7:59.) It is infused in us directly from God and is not a product of human generation. (Hebrews 12:9.) “Soul,” from the Greek word psuche, however, is a generic word and its meaning must be determined, in any given instance, from the context in which it appears (1980, 122:163, emp. added). In my above discussion on the use of the word “soul” in Scripture, I examined the various ways in which the Hebrew and Greek terms for soul are employed. I now would like to examine the various ways in which the Hebrew and Greek terms for “spirit” are employed within the sacred text. The Hebrew term for “spirit” is ruach (from rawah, to breathe). In their Hebrew and English Lexicon of the Old Testament, Brown, Driver, and Briggs noted that ruach has nine different meanings, depending on the specific context. Ruach may refer to: (1) the Holy Spirit; (2) angels, both good and evil; (3) the life principle found within both man and animals; (4) disembodied spirits; (5) breath; (6) wind; (7) disposition or attitude; (8) the seat of emotions; and (9) the seat of mind and will in men (1907, pp. 924-925). In the Old Testament of the King James Version, ruach is translated variously as the Spirit of God (i.e., Holy Spirit) 105 times, man’s spirit 59 times, spirit (an attitude or emotional state) 51 times, spirits (angels) 23 times, wind 43 times, and several other items (Morey, 1984, p. 51). The word ruach, like nephesh, has a wide range of meanings. First, it seems originally to have referred to the wind, which was viewed as being invisible and immaterial (Gen. 8:1). Second, since God is invisible and immaterial like the wind, He is described as “spirit” (Isa. 63:10). Third, since the angels of God are invisible and immaterial, they are called “spirits” (Ps. 104:4, KJV; cf. Heb. 1:14). Fourth, since the life principle which animates man and animals is invisible and immaterial, it is also called “spirit” (Gen. 7:22). In this sense it was viewed as the “breath” of life which departs at death. Fifth, since man has an invisible and immaterial self or soul which transcends the life principle by its self-consciousness, man’s “mind” or “heart” is called his “spirit” (Ps. 77:6; Prov. 29:11, KJV). The invisible side of man which is called “spirit” cannot be reduced to the mere principle of physical life or the breath of the body because man’s transcendent self is contrasted to those things in such places as Isa. 42:5. Also, man’s self-awareness as a cognitive ego obviously transcends the life principle which operates in animals. At death, this transcendent ego or disincarnate mind is called a “spirit” or a “ghost” (Job 4:15). This is parallel to rephaim or disembodied spirit (Job 26:5). Thus at death, while the life principle or breath of life ceases to exist in man or animals, the higher self or spirit of man ascends at death to the presence of God (Ps. 31:5; Eccles. 12:7).... Sixth, since attitudes and dispositions such as pride, humility, joy, or sorrow are invisible and immaterial, they are described as being someone’s “spirit” (Prov. 11:13; 16:18). The Holy Spirit is described as the “sevenfold Spirit” in the sense that He gives people the disposition, attitude, or spirit of wisdom, understanding, counsel, might, knowledge, fear and holiness (Isa. 11:2; cf. Rom. 1:4; Rev. 3:1) [Morey, pp. 52-53]. The Greek term for “spirit” is pneuma (from pneo, to breathe). In their Greek-English Lexicon of the New Testament and Other Early Christian Literature, language scholars Arndt and Gingrich noted that pneuma has seven different meanings, depending on the specific context. Pneuma may refer to: (1) wind or air; (2) that which gives life to the body; (3) disincarnate souls; (4) human personality or ego which is the center of emotion, intellect, and will; (5) a state of mind or disposition; (6) an independent, immaterial being such as God or angels; and (7) as God—as in the Holy Spirit of God, the spirit of Christ, etc. (1957, pp. 680-685). In his Greek-English Lexicon of the New Testament, Thayer provided five definitions for pneuma (1958, pp. 520-524). In the King James Version of the New Testament, pneuma is translated variously as Spirit (Holy) 165 times, Ghost (Holy) 88 times, spirits (good/evil, angels) 55 times, spirit (man’s) 45 times, spirit (attitude) 22 times, spirits or ghosts (man’s disincarnate soul) 7 times, spiritual (adjectival use) 23 times, life and wind 1 time each (Morey, pp. 60-61). The word pneuma in its various forms is found 406 times in the New Testament.... First, the New Testament writers carry on the precedent set by the translators of the Septuagint by using the Greek words for wind such as animas instead of pneuma. The only instance where pneuma definitely refers to the wind is in John 3:8 where there is a poetic play upon the sovereign movement of the divine Spirit and the wind. Second, pneuma refers to the life principle which animates the body. This is actually a very rare usage in the New Testament. For example, the false prophet who accompanied the Antichrist in the last days will make an idol “alive” (Rev. 13:15). Third, pneuma is used to describe the immaterial nature of God and angels (John 4:24; Heb. 1:14). Christ defined a “spirit” or “ghost” as an immaterial being (Luke 24:39). Fourth, pneuma refers to the disposition which characterizes a person, such as pride, humility, fear, etc. (1 Pet. 3:4). Fifth, pneuma is used to describe the disincarnate spirit or soul of man after death (Matt. 27:50; Luke 24:37, 39; John 19:30; Acts 7:59; Heb. 12:23; 1 Pet. 3:19).... Sixth, man’s transcendent self, or ego, is also called pneuma because of its immaterial and invisible nature (1 Cor. 2:11). It is described as the center of man’s emotions, intellect and will (Mark 8:12; Mark 2:8; Matt. 26:41). Since man’s pneuma transcends his mere physical life, it is frequently contrasted to his body, or flesh (Matt. 26:41; Mark 14:38; Luke 24:39; John 3:6; 6:63; 1 Cor. 5:5; 7:34; 2 Cor. 7:1; Gal. 5:17; 6:8,9; James 2:26). It is man’s pneuma which ascends to God at death (Acts 7:59) [Morey, pp. 61-62]. Since ruach and pneuma both derive from roots meaning “to breathe,” it should not be surprising that on occasion they are used synonymously, as the information in the following table documents. In the NT psuche appears under more or less similar conditions as in the OT. The contrast here is as carefully maintained as there. It is used where pneuma would be out of place; and yet it seems at times to be employed where pneuma might have been substituted. Thus in Jn. 19:30 we read: “Jesus gave up His pneuma to the Father,” and, in the same Gospel (Jn. 10:15), “Jesus gave up His psuche for the sheep,” and in Mt. 20:28 He gave His psuche (not His pneuma) as a ransom... (1956, 5:2838). While the “spirit” (pneuma) is recognized as man’s individual possession—that which distinguishes one man from another and from inanimate nature—on occasion the same may be said of the soul (psuche; cf. Matthew 10:28 and Revelation 6:9-11). The pneuma of Christ was surrendered to the Father in death; His psuche was surrendered, His individual life was given, “a ransom for many.” His life “was given for the sheep.” In Acts 2:27, Luke quoted Psalm 16:10 regarding Christ’s physical death: “Because thou wilt not leave my soul unto hades, neither wilt thou give thy Holy One to see corruption.” The word that Luke used for “soul” is psuche, which is employed here not only as the Greek counterpart to the Hebrew nephesh, meaning body, but representing specifically a nephesh meth—a dead body (cf. Numbers 6:6, 9:6, and Ecclesiastes 9:5). Thus, Christ’s body was not abandoned to hades. Hades is used in Scripture to refer to at least three different places: (a) the general abode of the spirits of the dead, whether good or evil (Revelation 1:18; 6:8; 20:13-14); (b) a temporary place of punishment for the wicked dead (Luke 16:23; Revelation 20:13); and (c) the grave (1 Corinthians 15:55; cf. Acts 2:27). In Psalm 16:10 (the passage quoted by Luke in Acts 2:27), the writer stated: “Thou wilt not leave my soul (nephesh) to sheol.” In the Old Testament, sheol also is used to refer to three different places: (a) the unseen abode for spirits of the dead (Job 14:13-15; Ezekiel 26:20; Jonah 2:2); (b) a temporary place of punishment for the wicked dead (Psalm 9:17); and (c) the grave (Davidson, 1970, p. 694; Harris, et al., 1980, 2:892; cf. Numbers 16:30-37 where the conclusion of the rebellion of Korah [and those sympathetic with him] against Moses is described in these words: “The earth opened its mouth, and swallowed them up, and their households, and all the men that appertained unto Korah, and all their goods. So they, and all that appertained to them, went down alive into sheol.”). In Acts 2:27 (hades) and Psalm 16:10 (sheol), the context seems to require the latter usage—i.e., the grave. Thus, both David and Luke were making the point (to paraphrase): “You will not leave my body in the grave, nor will you allow your Holy One to see decay.” In fact, just four verses later, the inspired writer referred back to David’s declaration and commented that “he foreseeing this spake of the resurrection of the Christ, that neither was he left unto hades, nor did his flesh see corruption” (2:31). Death, mortality, corruptibility, decay, destruction are never affirmed of the spirit. It is, in the nature of the case, impossible for a spirit to die. The scriptures affirm deathlessness of the angels; and the angels do not die because they are angels, but because they are spirits (1985, 127:692). Yet it also is impossible for a soul to die (Matthew 10:28; Revelation 6:9-11). However, as Hebrews 4:12 documents, there are times when the words spirit and soul are not used synonymously. The word spirit sometimes refers to wind or air (Genesis 3:8; 8:1; John 3:8); the word soul does not. The word spirit sometimes refers to demons (Mark 5:2; Luke 9:39); the word soul does not. The word soul sometimes refers to both the inner and outer man (i.e., a whole person; Exodus 1:5; Ezekiel 18:20; Acts 2:41; Romans 13:1); the word spirit does not. The word soul sometimes refers to a corpse (Numbers 5:2; 6:6; Psalm 16:10; Acts 2:27); the word spirit does not. The word soul on one occasion refers to an odor, fragrance, or perfume (Isaiah 3:20); the word spirit does not. Thus, while it is true that on some occasions the words “soul” and “spirit” are used interchangeably, in other instances they are employed in a non-synonymous fashion. As Woods observed, under certain conditions within Scripture “lexically, logically, and actually these terms differ and must not be confused” (1985, 127:692). In any study of these two terms as they occur within God’s Word, the context and intent of the writers are the deciding factors that must be considered and respected. Brown, Francis, S.R. Driver, and Charles Briggs (1907), A Hebrew and English Lexicon of the Old Testament (London: Oxford University Press). Ferguson, Kitty (1994), The Fire in the Equations: Science, Religion, and the Search for God (Grand Rapids, MI: Eerdmans). Marais, J.L. (1956), “Spirit,” International Standard Bible Encyclopedia, ed. James Orr (Grand Rapids, MI: Eerdmans), 5:2837-2838. McCord, Hugo (1995), “What is the Soul?,” Vigil, 23:87-88, November. Woods, Guy N. (1980), “What is the Difference Between the Soul and the Spirit of Man?,” Gospel Advocate, 122:163, March 20. Woods, Guy N. (1985), “What is the Soul of Man?,” Gospel Advocate, 127:691-692, November 21. I would like to express my deep, personal gratitude to the following men for their assistance in the preparation of this series of articles: Dr. Hugo McCord, professor emeritus of biblical languages, Oklahoma Christianity University of Science and Arts; Dr. William Woodson, professor emeritus and former chairman of the graduate program in Bible, Freed-Hardeman University; and the late Bobby Duncan, minister of the Church of Christ in Adamsville, Alabama. The changes and corrections they suggested that I incorporate into the finished manuscript were invaluable. The conclusions, however, remain the sole responsibility of the author.